Special to the Journal/Melanie Dunn Beaver Local’s Logan Ours takes on Hamilton Ross’s Ben Breaker in a 120-pound match during a Div. II quarterfinal on Sunday at St. John Arena in Columbus. COLUMBUS — The young but incredibly talented Beaver Local High School wrestling team and its large following of fans certainly made their presence known during the State Wrestling Duals held in historic St. John Arena on Sunday afternoon. The Beavers made history by becoming the first team from Columbiana County to advance to the Div. II State Duals. They then doubled their pleasure in their opening match Sunday when they became the first team from the county to win a State Dual match, destroying Hamilton Ross, 47-21. The win vaulted Beaver Local, ranked third in the state, against second-seeded Aurora which eliminated the Beavers 34-25 in a state semifinal. Later, Aurora lost the state title match to No. 1 seed St. Paris Graham, 38-24. 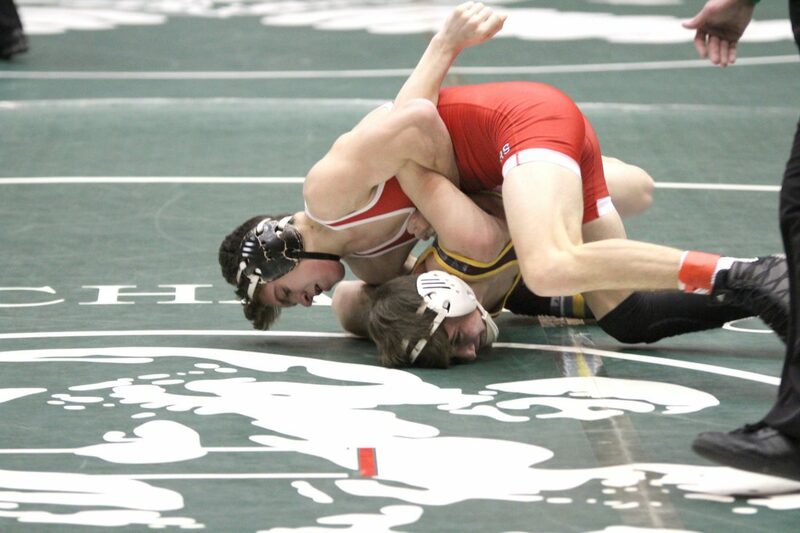 The experience of advancing to the State Duals was a win-win all around for Beaver Local, especially considering eight wrestlers in the Beavers’ lineup are underclassmen. “Absolutely (it was a great experience),” agreed Beaver Local head coach Jordan Williams. “Just the opportunity to come down here and wrestle against some of the best competition in the state. It was a great opportunity for our kids and a great opportunity for our fans. “It feels amazing (to have competed at the State Duals) because we worked really hard and it feels amazing to be here,” said Beaver Local’s 138-pound Jared Wright, one of the senior leaders on the team. Aurora head coach Johnny Papesh, a former standout wrestler with the Greenmen, had nothing but praise and respect for Beaver Local’s effect against his team. The Beavers opened the day with a 47-21 rout of Hamilton Ross which was making a second straight trip to Columbus. How dominant was Beaver Local in its opening win over Ross? Well, in its first seven individual matches, which were all wins, the Beavers surrendered a grand total of two individual points — not team points — individual points to the Rams. The Beavers rolled out to a 47-0 lead while winning their first nine individual bouts. Winning by pins for the Beavers were freshman Mark Emmerling Jr. (113), junior Cole McComas (126), junior Skyler Lasure (145) and senior Beau Smith (170). Winning by decisions for Beaver Local against Ross were freshman Jaymin Salsberry (106), freshman Logan Ours (120), sophomore Jonathan Potts (132), senior Jaret Wright (138), sophomore Logan Krulik (152) and freshman Brenden Severs (160). “We always love the fans,” added Wright. Wright was asked about the strength of his game. This year’s Beaver Local team blazed a new trail by qualifying to state and Williams feels the best is yet to come. In the semifinal loss to Aurora, the Greenmen were successful in holding serve against the Beavers’ outstanding lower weights and then won the majority of the middle weights and locked up the win after the 195-pound match. The Greenmen then forfeited the final two weight classes to the Beavers. Winning by a pin for the Beavers against Aurora was 120-pound freshman standout Logan Ours, the No. 3-ranked D2 wrestler in Ohio, who pinned Bo DiJulius in 3:30, while winning by a decision for the Beavers was 126-pound senior star Cole McComas, who whipped Aurora’s Brian Kennedy 15-3. That win temporarily gave the Beavers a 10-7 team lead over the Greenmen. But Aurora tied the match at 10-10 after with a win by decision at 132 and never trailed again. Beaver Local’s other win by decision was garnered by freshmen Brenden Severs who rolled to a 10-3 win over Aurora’s Ethan Anderson. Winning by forfeits for the Beavers were Garrett Givens (220) and Daniel Wirth (285). Williams was very proud of his team’s effort in both of their state matches. Williams made sure to praise the great following of Beaver Local fans that made the trip and showed so much support. Hamilton Ross, Beaver Local’s first-round state opponent, was the only Div. II team that made a second straight appearance in the State Duals. St. Paris Graham also returned but competed in Division I last season, winning the title. The Falcons opted to go back to Div. II this season. In Sunday morning’s other quarterfinals, Sandusky Perkins trailed by over 20 points but rallied to nip Indian Valley 35-33 and St. Paris Graham rolled London 62-8.